This blog is about saving the sweet life (aka optimizing global pleasure) through well-informed, aesthetically tuned, and ethically motivated acts. Although the sweet life might be conceptually opposed to the sour life, in reality, they are as deeply connected as the waters of currents running through the one big ocean that has mothered us all. 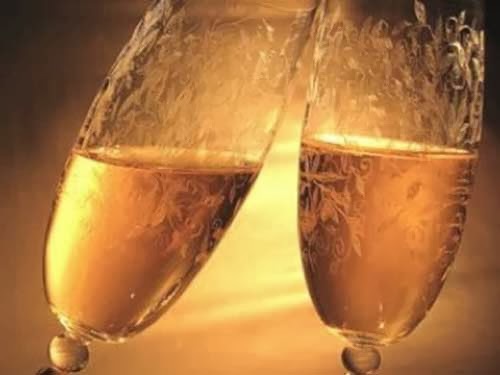 Since beginnings and endings are usually remarkable, let's end 2013 with a toast to optimizing global pleasure. Global pleasure is the aggregate of what gives pleasure to each one of us on this earth, minus all of the pain. For purposes of a toast that embodies the good life and its practices, such as preserving vibrant ecosystems, the beauty of biodiversity, good friends, food, and community-- Would you choose Champagne Krug Clos D'Ambonnay 1996, from Champagne, France, with a rating by Gayot of 19/20 and a cost of $2200 or Schramsberg 2008 Blanc de Noirs from the North Coast, California, priced at $41 and rated 14.5/20? Each of us would need to inform ourselves regarding the main values entering into this goal and optimization process, then weigh key factors to determine which best serves our goals: wine characteristics vs price vs quality against sustainability concerns against resources against belief in the value behind such a high price in the context of a New Year's celebration with friends who are ecologically-committed and wine enthusiasts. Then we would sum up the results and choose a champagne, feeling all the while that we are saving the sweet life one sip at a time. Probably the very first thing we might ask ourself is why should I care? How are I and my loved ones living in Santa Barbara in fact seriously affected by Fukushima? Especially in this Internet-connected atomic age, none of us is completely separated from the other. While the Fukushima meltdown happened far away, it affects us intimately in diverse ways here in Santa Barbara. We are both directly affected by the transport of radioactivity in material forms such as air, water, marine life and food, and we are also indirectly affected by characteristics of the event that affect our daily decisions, such as unconscionably poor reporting by individuals and agencies as well as the the lies and deliberate obfuscation of outcomes from this and other nuclear events. For reasons why, just follow the money. Money, status, fears for the future of self and family, ignorance, presumption, diversity of perspectives and knowledge, uncertainty, complexity, and radioactivity all play a part in how nuclear events affect us. One month after the meltdown at Fukushima all kelp tested off the California coast from San Diego through Santa Barbara to Santa Cruz revealed Iodine-131, a short-lived radioactive isotope, with increases as much as 250 times previous levels. Because kelp concentrates iodine, it can serve as a canary in a coal mine, warning biologists of possibly dangerous increases in radioactivity. The quotes below reflect a similar situation: the possibility that the Fukushima meltdown is contaminating our bodies through our food supplies. While none of these reports should be treated as scientific reports, neither should they be dismissed without consideration. "Kelp along the California coast was found to be contaminated with radioactive material from a nuclear plant damaged in the March 2011 earthquake and tsunami that struck Japan, according to a recent study. Researchers at California State University, Long Beach found that the kelp contained radioactive iodine, cesium, xenon and other particles at levels unlikely to be detrimental to human health but much higher than the amounts measured before the disaster. The levels were also about the same as those measured in British Columbia and Washington State after the 1986 Chernobyl nuclear power plant explosion. The researchers also expressed worry that the radioactivity could have made it into the coastal food chain, although they weren’t sure what impact that could have. “Radioactivity is taken up by the kelp, and anything that feeds on the kelp will be exposed to this also,” said co-author Steven Manley in a news release. Medical experts, however, said the disaster’s impact on U.S. public health was likely insignificant. " "Santa Cruz had the next highest level, with 2 Becquerel per gram. The concentrations in Santa Barbara and Pacific Grove were significantly lower, under 1 Becquerel. When kelp from the same California sites was resampled a month later, in May 2011, it contained no detectable amounts of radioactive iodine. 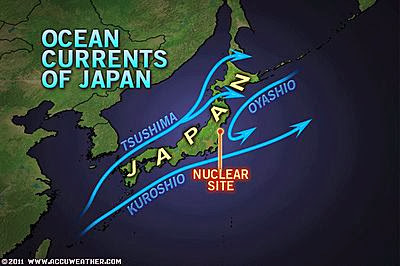 Currents transporting radioactive elements either in the water or in marine life start with the Kuroshio, just off the coast of Japan, a few degrees latitude north of Fukushima, at 40 degrees north latitude. The Kuroshio Current merges there with the Oyashio Current, where these waters become known as the North Pacific Current. 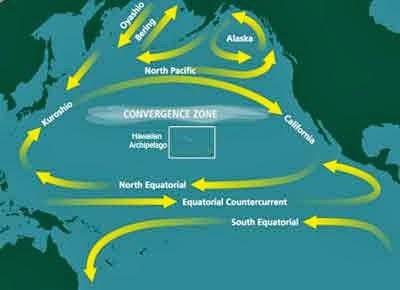 The North Pacific Current flows east to the Pacific West Coast, where it again splits to form the Alaska current, heading north, and the California Current, going south. Whatever is in the water gets diluted , that is true, but transported nonetheless. From the best information, radioactive materials continue to be discharged from Fukushima into currents that have been carrying these toxic elements home to Santa Barbara and residents. Riding currents, Bluefin tuna travel back and forth between Japan and California. Sometimes they spawn off Fukushima, then migrate to the West coast to feed and reproduce. Bluefin tuna caught since Fukushima's meltdown all show increased levels of radiation, specifically, cesium 134 and 137, both recent artificial products of nuclear fission, discussed in the next post. 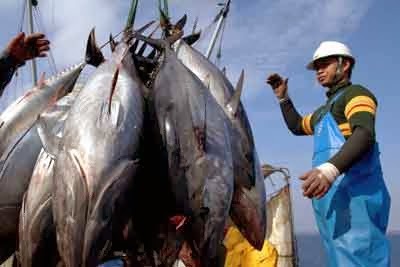 Migratory species such as salmon and Pacific herring, species not as well tested for radioactive isotopes as tuna, which can fetch prices as high 1.8 million dollars for a bluefin of 222 kg at the Tokyo market in as January of 2013, ,also range between Japan and the west Coast. What does this mean to residents of Santa Barbara--fish, people, water, plants, and other species that live in the water, the air or the soil? As a rule, we are motivated to protect our family and homeland, but in a nuclear age, homeland is virtually without borders. How is Fukushima threatening the good life of Santa Barbara residents? Why is there so much disagreement and confusion about the outcomes of nuclear meltdowns and melt-throughs? What can be done to preserve and restore quality of life? Understanding nuclear events is challenging. Knowledge about what happens after nuclear events tends first to be kept behind closed doors by those most likely to be held accountable (usually corporate and government powers). Second, the language used to report nuclear events is replete with confusing terms. Third, human nature is such that after a few exposures to confusing often contradictory reports, we humans begin to avoid the entire issue, as too frustrating. In the next post we address the key concepts and contexts of nuclear events with which we must become familiar in order to assume responsibility and control over our nuclear future. We will try to follow Einstein's guideline of making everything as simple as it can be but no simpler. The next post introduces and explains key concepts important for the process of assuming responsibility and control over the quality of our lives here in Santa Barbara, using Fukushima as an example of a catastrophic nuclear event. Meanwhile, Here's to fracking Fukushima.